A new year is a time for new resolve, new goals, and amazing growth both in your personal life and your business life. It is a blank slate, and you control the chalk. One of the best ways to do this is to use funds that are available to you in the cash credit tier to make your business even better. Maybe you need to grow, expand, or just up your game a little. Perhaps you are a startup trying to figure out how to get the ball rolling as January 1 gets closer. If your business is still in the planning phase, you may need to actually fund your business. The cash credit tier can help you do all these things and more. What is the Cash Credit Tier? These are generally high limit credit cards not linked to a specific retailer. Often, they offer loyalty rewards such as cash back on purchases, airline miles, or points that you can redeem for cash credit or gift cards. They may have promotional interest rates, including no interest for a certain time. Sometimes there is even a sign-up bonus. There are many ways this type of credit can help your business, from building to expansion and everything in between. If you happen to have access to the cash credit tier when you first start your business, it can actually help you get your feet off the ground. You can fund your business with these types of cards in the startup phase until your business starts turning a profit. Sometimes, you have to spend money to make money. That’s really no secret. In business the opportunity comes along often. What does it look like? It may be that you can get a great deal on inventory that will result in lower cost, which increases profit even if sales stay the same. To take advantage however, you may need to purchase in bulk, which can mean a larger cash outlay than your cash on hand can handle. As you can see from the table, you could significantly increase profits by taking advantage of the special pricing. 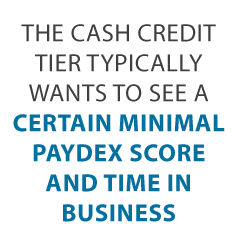 It isn’t possible for many, however, without access to the cash credit tier. If you normally buy 200 widgets at a time, but need to purchase 1,000 to take advantage of the special pricing, you will need $80,000 more in cash. This can significantly deplete cash reserves if the cash is even available at all. By using cards in the cash credit tier, you can make the purchase, increase profits, and potentially earn rewards or cash back at the same time. The profit on the original 200 widgets would have been $10,000. By using the funding available through the cash credit tier, that profit increases to $14,000. If you are using a card that offers even just 1% cash back, you would earn $1,000 on the purchase of the inventory. Generally, you would use that to reduce the balance on the card, thus further reducing cost and increasing profit. Sometimes life happens. Mr. Murphy can pay a visit at the most unexpected times. No matter how carefully you budget, you may need a little help getting through. If you need to replace equipment or make repairs, you need to do it quickly. If you don’t have the cash, you could be in a real predicament. You also may not want to deplete cash reserves unnecessarily. This is where the cash credit tier can help. Use it to make the repairs, replace equipment, or whatever else you may need to do right away. Pay it off when you can, and your business doesn’t have to miss a beat. Ready to sign up yet? Not so fast. While it isn’t hard to get started, there is a process. You cannot just jump into the cash credit tier. Creditors deny businesses for these cards every day. Why? Usually it is bad business credit or a lack of business credit. You absolutely must have established, strong business credit to be able to access credit at this level. While it may seem impossible, I assure you it is not. It is true, you have to have credit to get credit. Most often this means you have to use the merits of your personal credit to get your business credit off the ground. If your personal credit isn’t great though, that will not work. There is another way however. You can actually build business credit and gain access to the cash credit tier without ever even having a personal credit check. To get started, you have to dedicate yourself to building business credit in the new year. Make a resolution, if you will. Then, stay the course. It takes time, but if you trust the process, it will work. Some never make New Year’s resolutions because they never stick. Some make them anyway, and they still don’t stick. Others, a select, rare few, make them and follow through every year. If your New Year’s resolution is to build business credit and gain access to the cash credit tier this year, don’t let it go the way of making your bed every day and losing weight. Stick it out with these tips. The head is where is all starts. This is true of everything, whether it be a New Year’s resolution or a brilliant business idea. You have to get your head in the right place. Your business has to be in the right place before this particular resolution will have staying power. I don’t mean its physical location. I mean it has to exist, on its own, as an established business separate from its owner. What does that mean, and how does it happen? Many business owners simply run their business as an extension of themselves, especially in the early stages. They may list their own address and phone number as the business contact information. The business finances run through their personal bank account. Even their Social Security number is tied to the business. When it comes to building business credit to access the cash credit tier, this cannot be the case. Incorporate in some way. Choose a corporation, S-corp, or LLP. Do not operate as a sole proprietor or partnership. Incorporation gives a business its own identity and protects the owner from liability. Obtain an EIN and stop using your SSN as the identifying number for your business. Set up an address and telephone number separate from your own and have your business listed in the directories with this contact information. Set up a dedicated business email address and professional looking website for the business. Open a separate bank account under the business name and run all business transactions through this account. Before you can have business credit, you have to have a business credit profile. You cannot have a business credit profile unless you have accounts reporting your payments to the credit agencies. You guessed it. That means you cannot have business credit without first having credit. How do you get around this conundrum? You breathe life into your business credit with the vendor credit tier. These are starter vendors that will offer Net30, Net60, or Net90 terms and then report your on-time payments to the credit agencies. While each of the three biggest credit reporting agencies, Experian, Dun & Bradstreet, and Equifax have slightly different requirements for when a credit profile is available for a business, generally speaking you have to be in business for at least 6 months and have at least 3 accounts reporting. The easiest and quickest way to get these accounts is by starting with the vendor credit tier. While you may or may not get a better price with a different vendor, if you are trying to build business credit so that you can eventually access the cash credit tier, you need to do business with at least three vendors in the vendor credit tier. There are many, but these are great starting point. o Use Quill to order supplies you use every day, including pens, pencils, folders, printer ink, copy paper, and even cleaning supplies. o Order shipping supplies, janitorial equipment, and more through Uline. o Grainger offers industrial supplies as well as tools that you will need in the course of regular business. It may be necessary to place a few initial orders with each of these before you can get net terms. There is no need to order anything you do not need however. They each sell things that business owners need in the everyday operations of a business, and once you make your on-time invoice payments and they begin reporting those payments to the credit agencies, you have successfully brought your credit score to life. After you establish your business as an entity separate from yourself as owner, and you bring your business credit profile to life using the vendor credit tier, you can begin to grow your credit score even bigger and stronger with the retail credit tier. These include retail cards such Lowe’s, Amazon, Costco, and even Walmart. If you try to apply for a business credit card with these creditors without first establishing your business credit, they will deny you. Most of them require a certain amount of time in business, and virtually all of them want to see a PAYDEX of 78 or higher from Dun & Bradstreet. Once you reach that point and have about 8 vendor accounts reporting, you can apply for these cards. Using them and making consistent, on-time payments is like nourishing food to your credit score. These creditors will report your payments to the credit reporting agencies, and you score will grow. Once your business credit is strong enough, you can move on to the fleet credit tier. This is like the heart of your business credit in the sense that it begins pumping it where you need it to go. The goal is the cash credit tier, and this is how you get there. Fleet credit includes cards you can use to purchase fuel as well as repair and maintain automobiles. Shell, WEX, and Fuelman are just a few examples of companies that offer fleet credit. By working through the vendor, retail, and fleet credit tiers, you build your credit muscle to the point that it can do almost anything. It is big and strong. Now, it can break into the cash credit tier. There are plenty of options here, including cards that offer travel rewards, loyalty points, and cash back opportunities. Choosing the one that works best for your business will take some research. You will need to consider the interest rate, along with the type of rewards that will be suit your needs and spending habits. For example, if you do not travel often, you wouldn’t want to choose a card that offers stellar travel rewards but nothing else. If you buy a lot of gasoline, you need to look for the card with the best fuel rewards. You get the idea. While there are far too many cards to list, here are a few to give you an idea of the types of rewards and interest rates available in the cash credit tier. This card boasts no annual fee and 0% interest for 12 months. After that, the rate increases to 13.74% to 23.74%. You earn 10 miles per dollar when you pay for hotel rooms at hotels.com/venture. This makes it a great deal for those who travel often. In addition to this, you also earn 1.25 miles per dollar spent on all other purchases. With the Blue Cash Preferred card, you earn 6% back on all purchases at U.S. supermarkets up to 6,000 spent annually. After that you earn 1%. Additionally, you earn 3% back on purchases at gas stations and certain U.S. department stores, and 1% back on all other purchases. This one also offers a 0% promotional interest rate for the first 12 months, then the rate goes up to 14.99% to 25.99%. The Citi Double Cash card offers 1% back on all purchases, and then earn another 1% back on all payments, as long as you pay at least the minimum due each month. You also get a 0% promotional APR with this card, and it extends to the first 18 months rather than only 12. Now that you understand the anatomy of the cash credit tier New Year’s resolution, you can get to work. There is no better way to start the new year than resolving to build your business credit and access the cash credit tier fund and grow your business. Just remember, like any resolution, you have to power through. Don’t give up after a few weeks when the new wears off and revert back to old habits. Keep making your payments consistently on-time. Monitor your progress my keeping an eye on your credit report. A credit monitoring service is a great way to do that. An added bonus is that you can see your progress, which will help keep you motivated. Before you know it your business credit, and your business, will be stronger than ever.